Using the definition of blocks, a page is a container of blocks. Where each application is created with a least one page that has the default name “pag1”. 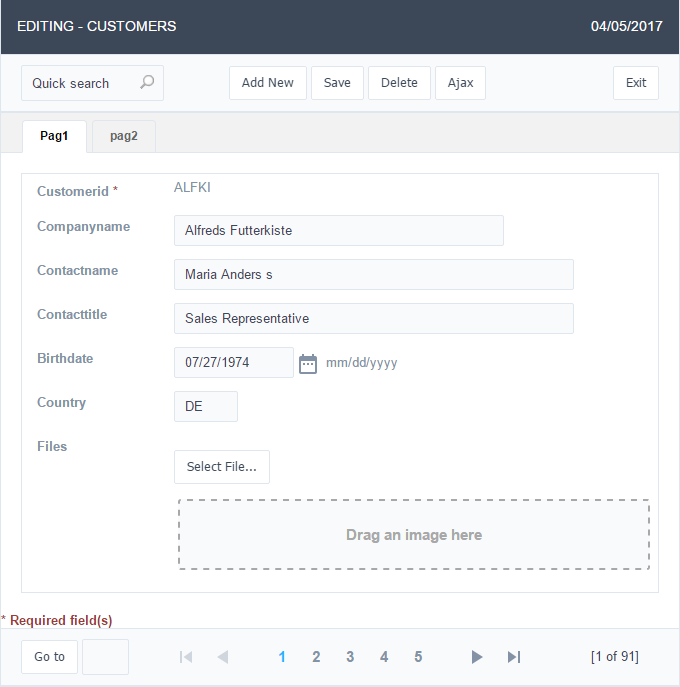 In applications of the type Form, Control and Search is possible to create many pages for an application. The pages are Tabs where each tab contains blocks defined in the block settings. Pages (available only in the Form, Control and Search applications) configuration Interface. See the example below of the Form application using two Pages: General Data and Documents. 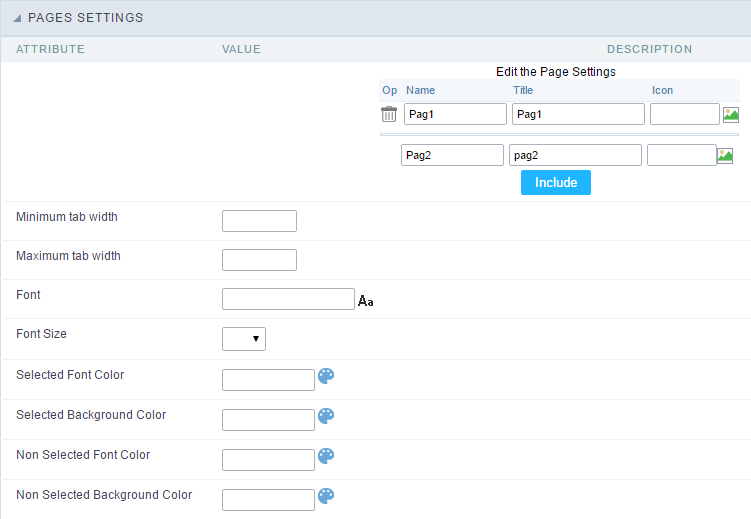 Form Application using Pages feature. 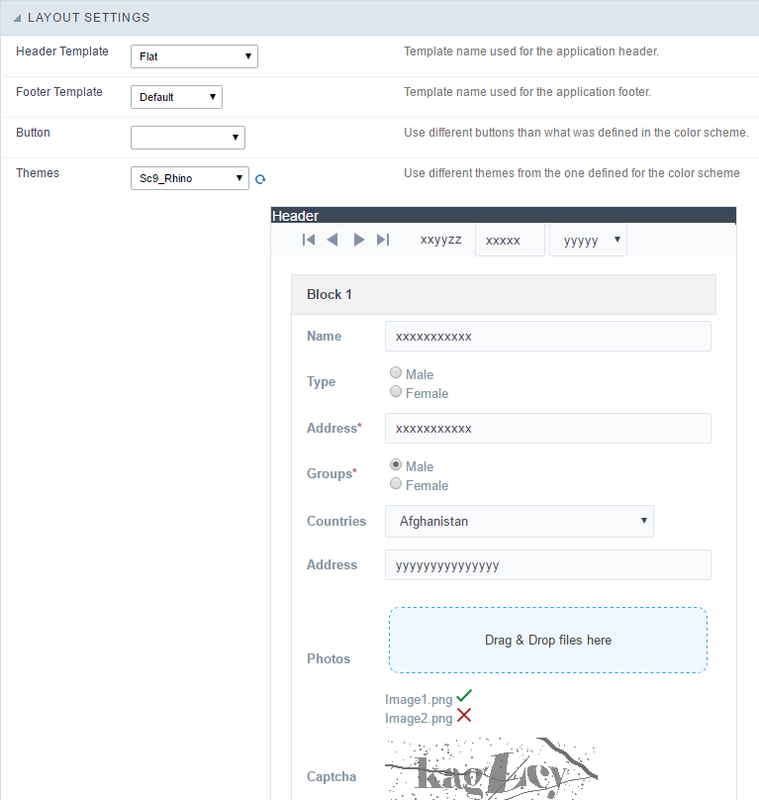 The form application already comes with a default page, identified as Pag1, that can be renamed, with the creation of new pages. The use of pages is indicated when you have an application that contains various fields of a table (more than 20 for example). 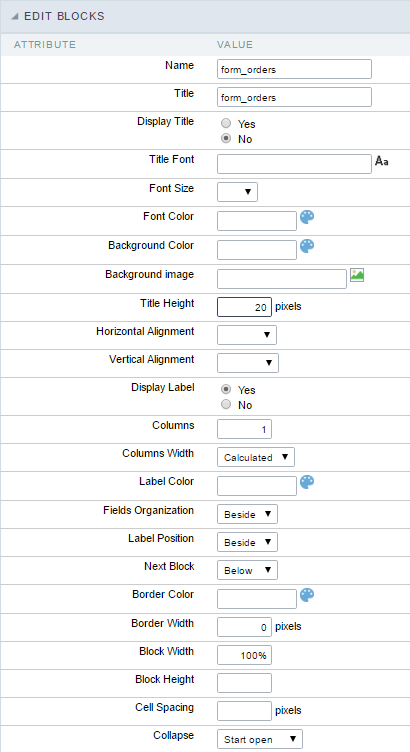 A form with more than 20 fields vertically placed would be difficult to use. An application can contain various pages, and in each one of them you can add various blocks. Including A new page, just inform the two fields above the button Include, on the first field you’ll inform the name of the page and on the second field you’ll select the image that’ll represent the icon of the folder, a then click on Include. Deleting A page, just click on the Garbage Can icon corresponding to the line of the page. Font : Allows to define which font-family will be displayed in the field. Clicking on the icon existing on the right side, it opens a page to select the font. Just select the font from the list, and it’ll be applied to field, leaving to you just to confirm the font. Font Size : Informs the desired size for the font. 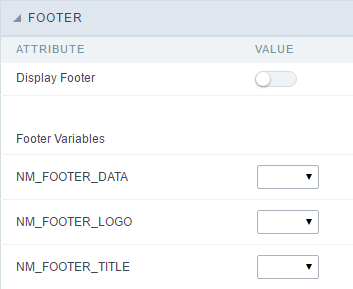 Selected Font Color : Field to set the color for the text that will be in the Selected Tab. Clicking on the existing icon to the right of the field opens a screen containing a color palette. When the selected color is selected, the selected color will be automatically transferred to the field. 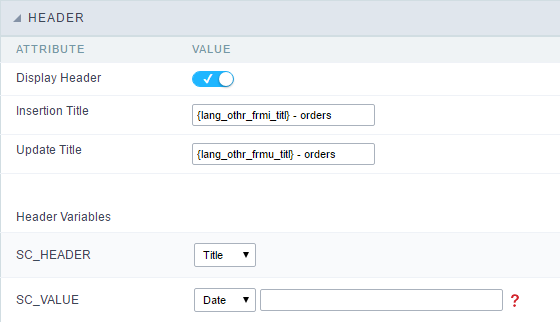 Selected Background Color : Field to set the color for the text that will be in the Selected Tab. Clicking on the existing icon to the right of the field opens a screen containing a color palette. When the selected color is selected, the selected color will be automatically transferred to the field. Non Selected Font Color : Field to set the color for the text that will be in the Selected Tab. Clicking on the existing icon to the right of the field opens a screen containing a color palette. When the selected color is selected, the selected color will be automatically transferred to the field. Non Selected Background Color : Field to set the color for the text that will be in the Selected Tab. Clicking on the existing icon to the right of the field opens a screen containing a color palette. When the selected color is selected, the selected color will be automatically transferred to the field.